A number of tech blogs were abuzz this weekend with reports that Verizon Wireless could begin pushing out Google Android 2.2 "FroYo" updates as early as tomorrow. The 2.2 update, like many recent over-the-air updates on other platforms, is likely to be a phased deployment, meaning that it may take as long as 2 weeks before your phone receives the upgrade is available notice. I haven't seen any of the Motorola Droids that I support pop-up the upgrade available notice yet. 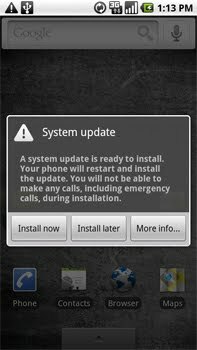 When the upgrade becomes available for your phone, a notice similar to the following will appear. "FroYo" for those not in the know, stands for "Frozen Yogurt." Google's other Android updates have been code named "Donut", "Cupcake", and "Eclair." At least their updates are getting healthier. 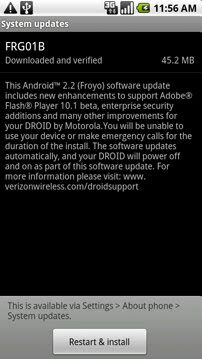 You can download the official Verizon Wireless Motorola Droid 2.2. update release notes from Verizon as a PDF file.